It’s always nice to get another old Citizen, especially one that’s in great condition as this Gold Series D060 Windsurfer happens to be. 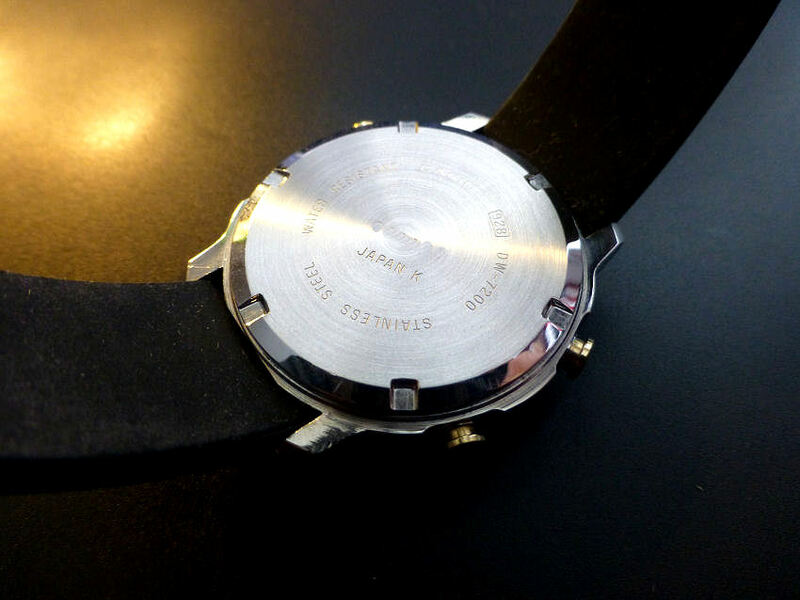 This one is from 1989, made in Japan, in solid stainless steel and in a neat size at 39 mm x 39 mm and just 10 mm depth. Once again “windsurfer” in basic form it has to be said, even though it does feature an Auto-Chronograph and countdown function, has Timers and can read time groups such as 5 minutes, 3 minutes and so on with countdown function it’s not quite up there with the latest specialist watches today. It doesn’t have such things as tide data, wave heights, swell or wind direction or indeed speeds. Nor does it have water and air temperatures and so on. This sort of data is reserved for models from the likes of Rip Curl, Nixon, Vestal, Freestyle, Casio and Electric to name a few. But this was early days and an attempt to manage some of the timing requirements of a new developing sport. Great display, even after nearly 30 years. 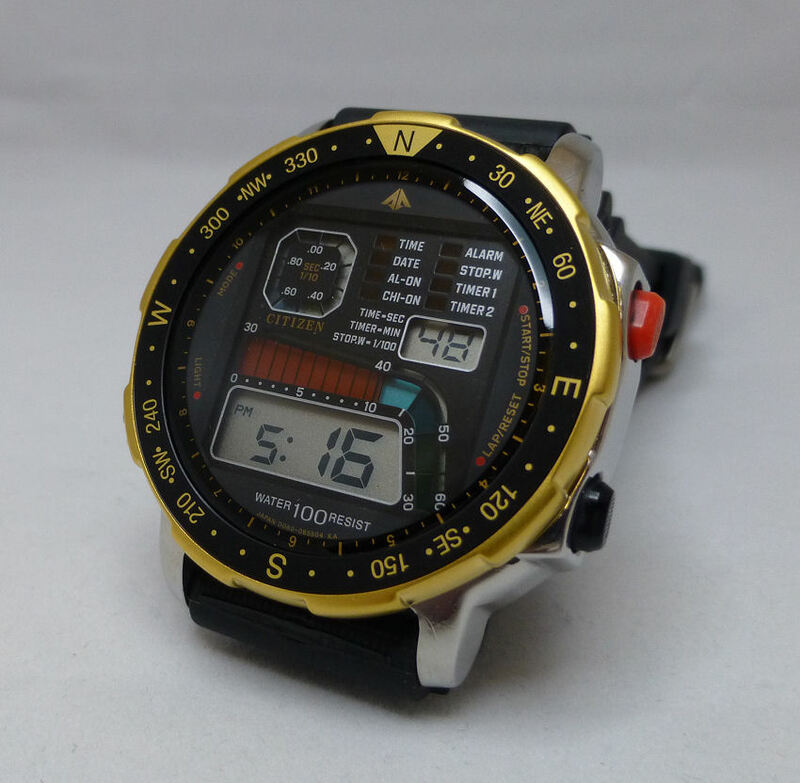 Functions are – Time, Day and Date and Month, dial light, Alarm, Signal beep, Timer 1 (which is also the Auto-Chronograph) Timer 2 and Stopwatch with Split, Memo and Lap timing. The display sections basically can provide group timings as countdown visuals for various periods. It also features a rotating 2 way bezel and a decent 100 m Water Resistance. Once again it’s one of those multi dial display models that always impresses and shows how clever Citizen was in producing displays that managed to show intuitively and clearly. The splitting up of display sections allows different timings to be read easily. This model also has quite an involved Chrono-Countdown function which initially requires checking out the instructions – unfortunately I only have the Quick Set reference sheet and could benefit from a full instruction manual to fully understand the functions properly. Note – As the D060 features a single line display – the Day, Date and Month are viewed by toggling the lower right push button – the Day features on the top right display (where the seconds are showing in the image) – whilst pressed the Date indicator under the Time shows. 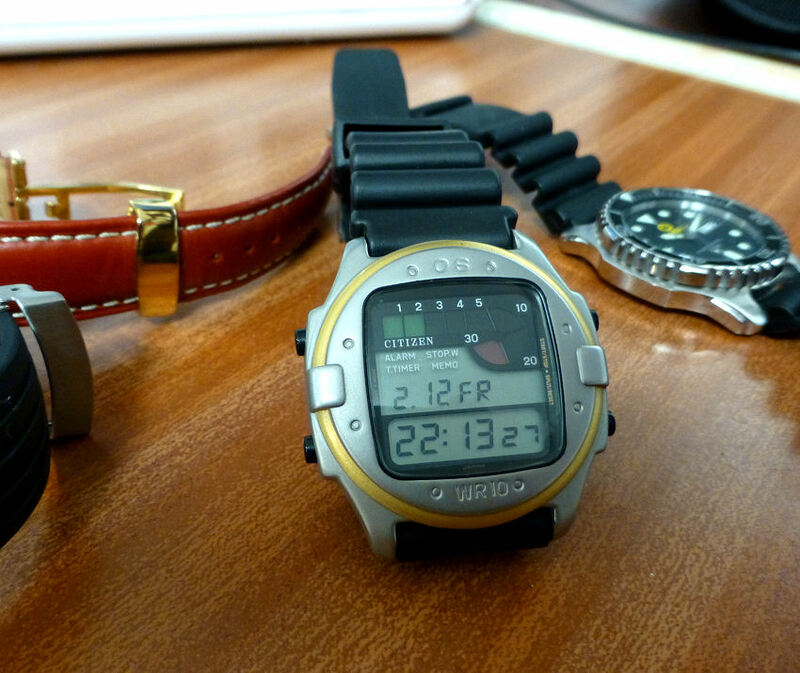 (the D120 model shows the Date/Day and Month above the Time as it features a dual line display). Other brands have tried, mostly unsuccessfully, with either Digital, Ana-Digi or Analog only, to multi-read various timing data easily and found it tricky to manage without making the dials cluttered and unreadable. As a result only few analog and analog/digitals managed this feat as well as Citizen at the time. And there’s no doubt that digital, handled properly, as in this D060 here is a really good example of this art. I particularly like the way color is used within the displays to effectively highlight different timing data with good clarity. Overall this is a really good looking watch and is sure to produce plenty of comment when worn on a sleeveless wrist (poser time!). Mostly I guess because it’s that bit different from today’s models and specifically as this one scores highly being virtually New Old Stock condition, externally, internally and in functionality. For me these old stainless steel bodies Citizens seem preferable to the resin bodied models that were really staring to flood the market in those days. Each competing for top spot to the new customers who loved the idea of complication models covering all sorts of sports and pastimes. Citizen however stayed mostly with steel cased models whereas their competitor Casio opted for the resin cases pushing the plastics technology to unprecedented levels, even to this day. Though that said the last Post illustrates that Casio too could produce stunning stainless cased models too, like the Pentagraph – another personal favorite. NOTE 1 – For all you true “Windsurfers” out there I have to say that the vintage “surfer” watch, like the above Citizen have to be regarded as – vintage watch collectors pieces. And if you take the sport seriously (and I know a couple of guys who are obsessed and seem to travel the world for a decent wave! ), then you’ll have to have the proper watch kit. So for you I can only recommend you follow the link as the writers appear to have a good idea as to what is required. My favorite is at the foot of this page however – but that’s just me . . . . NOTE 2 – There are a few of these on offer on the Web, but beware of over-inflated prices. I’ve seen these from £350 to £500! which is excessive. Remember most are pre-owned and whilst some may indicate New Old Stock, the strap is rarely original and sometimes there are so called shop movement damage – I find this debatable especially if there are scratches. . . . . So my advice – take care and don’t get carried away – expect to pay up to around £150 and look carefully at all images and check/ask questions to ensure module/display segments are all working properly. As ever – Buyer beware! The D060 Windsurfer has a CR2016 battery, which is easy to change. 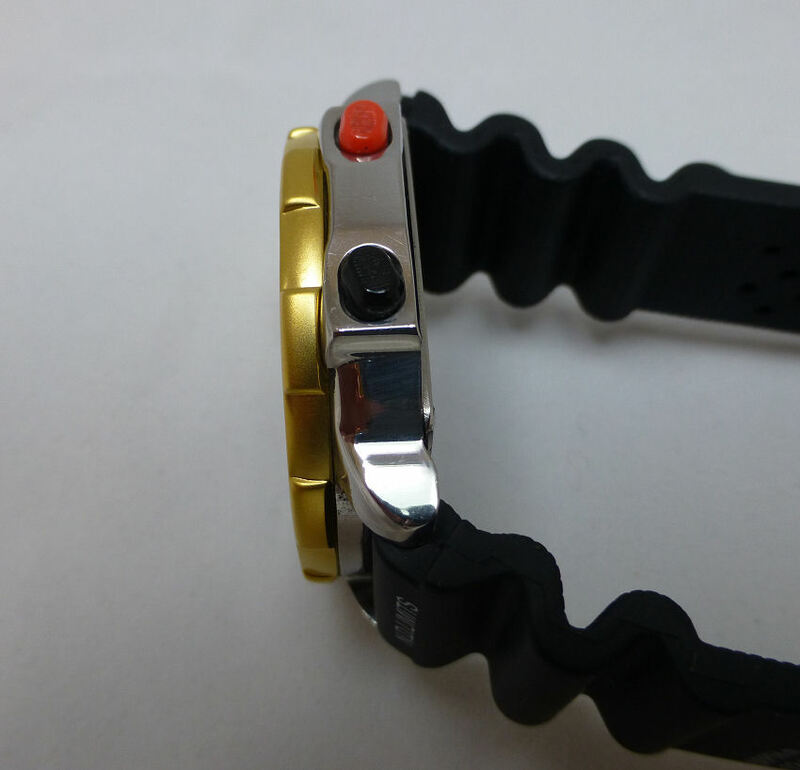 It basically sits in the center of the watch, held by a full spring catch cover. I attach photos here. CR2016 under sprung battery holder plate. Battery cover un-catches from the lower – here shown with battery removed. Stainless steel back (4 screws), rubber sealing ring and battery spring cover. (bottom twin bar is the spring release). This is my Casio DW-7200 Penta Graph Referee match timer which was manufactured in Japan in 1989 and a rather rare find today especially when it’s in almost perfect as new condition. 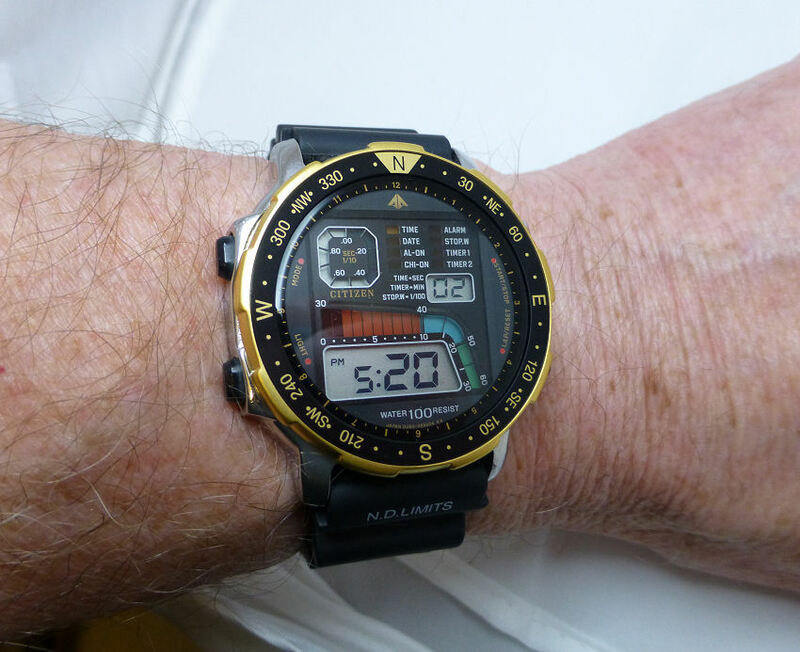 This model is from the DW 7000 stainless steel series and in regards Casio digital model, is just a little different from the ubiquitous resin cased ones at the time. With its 200m Water resistance and heavy solid stainless steel case, contrasting gold bezel, plus gold plated pushers and large clear crystal, it is a very sharp and stylish watch. 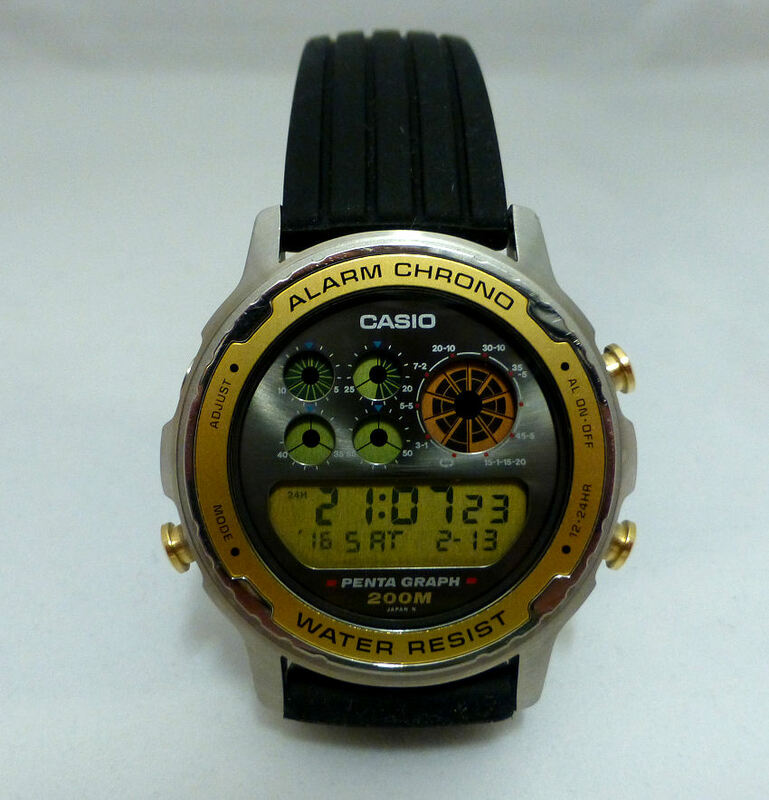 Casio DW-7200 PentaGraph from 1989 – Japan made referee timer. I particularly like this model with the inset gold bezel effect in contrast to the stainless case, and style-wise even after nearly 30 years it looks as if it was made yesterday. As to functions – this clearly displays Time, Day and Date, Month, am/pm and features 5 independent Alarms plus an hour on/off signal. A Chronograph and a Score Keeper for 2 sides – you can keep score while the timer is running in another mode. It also features an amazing array of Competition Timers: 1 free timer, 1 auto timer and 9 other sports timers (Boxing counts 3 min-break-3 min, Soccer 45 min–15 min break -45 min and so on AND these can all be changed to suit changed rules and/or timings in the future or for different sports. In other words this model is ideal for any number of timing tasks (find one that does that today!). Casio DW7200 Pentagraph multi-timer displays and 200M Water Resistance. Named Penta Graph basically as it features 5 digital counter/graphs, including a selector display and of course the main Time and Calendar display @6. It’s powered by a standard Lithium battery. With many of these vintage digitals, it can take some trial and error to see what’s what, but fortunately it’s not difficult to master, which is a plus point regarding these vintage modules – their ease of use and general intuitiveness. However in this instance I do have the instructions Casio928PentaGraph which also covers 7 other modules. 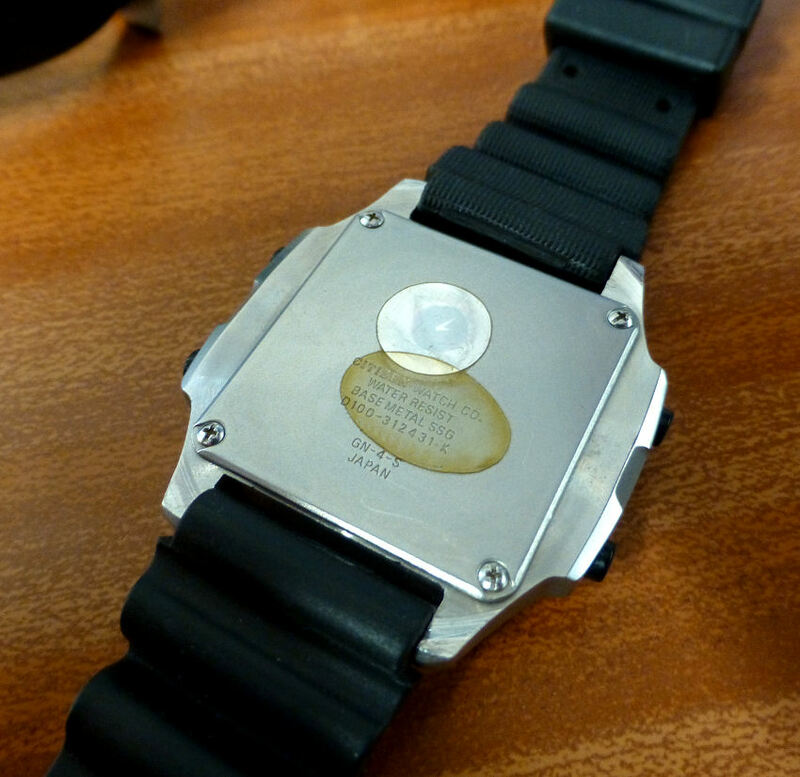 Note this model sports a 200 m Water Resistance, courtesy of the circular solid stainless steel screwed back. The Module and model number as usual are scribed on the back (I have obscured the serial number – an annoying consequence of the ease of Internet abuse). This is a great addition to my little collection and it has a rarity simply owing to it’s terrific condition and unusual functionality, which I love and the fact that such complications have been integrated so seamlessly into such a stylish watch. A bonus is that’s it’s also easy to use and yet accomplishes so much. It’s odd when you talk of rarity and the likes of Casio, Citizen and Seiko in the same breath as these companies were and still are mass producers of watch models. It’s not as if they produced Limited Editions in those days, but often the rarity is simply that these models are no longer around. Unfortunately battery technology lagged well behind the module science and many watches stopped working owing to battery corrosion. In many cases the owners simply chucked them in the drawer and probably bought the latest one as a replacement, with the old model eventually being chucked out at some future date. So to find any 1970-1990 digital watch model in pristine condition is pretty much a rarity in itself, let alone being rare for any specific functionality. This particular DW-7200 however scores on all fronts – great cosmetically, fully functioning module wise and unusual in it’s actual feature set. And let’s face it where else can you get a “referee” match timer model today as stylish as this? Note – I seem to recall a PGW-30 and 92, with similar functions but both were resin cased I think. Also a Casio SW-110(512) Soccer Timer, but none quite as stylish as this model. I love it when I find a watch model that doesn’t appear to fit with the familiarity of the “normal” version and especially when it’s from the Golden Era of the big three Japanese brands – Citizen Casio and Seiko. Take the unusual cased D100 Citizen Promaster Windsurfer, which unlike the standard black resin model features a metalised reshaped case with the addition of an orange/yellow outer bezel stylised colorway band around the top face. It alters the look considerably. 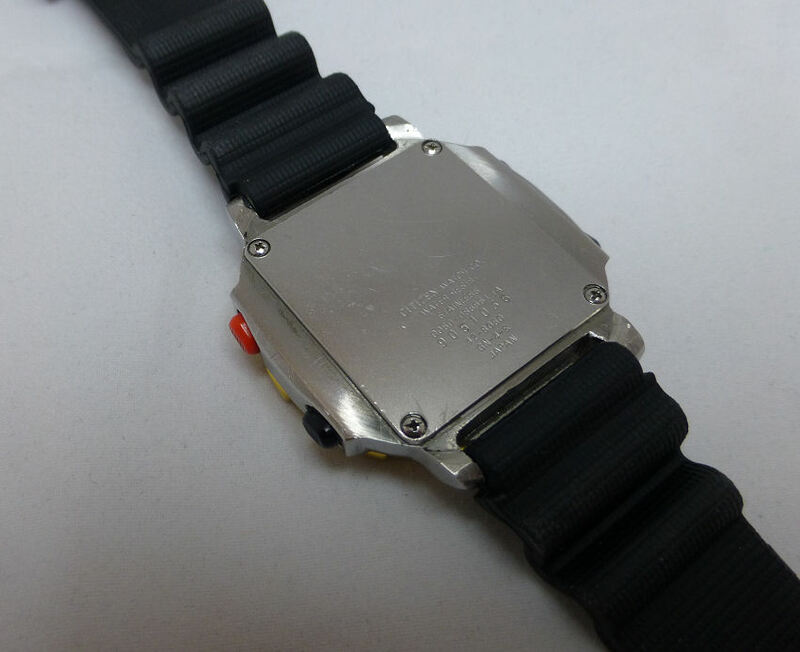 This one lost its original black resin strap somewhere along the years and has an alternative Casio strap, which in all honesty could easily have been the same as the original, though minus the printed wind-speed data. A good point to note with these older vintage models is the use of standard spring bars, so alternative straps are possible, which is a plus over many current models. The D100 model was introduced back in the late 1980’s (this one is 1988) and so far I’m unable to find a Manual for it. However as with many of the older digital models it’s fairly intuitive and the basic timekeeping functions are easy to work out and operate. This model has a Memo function so Stopwatch events (I think 5) can be stored in memory and recalled later. I have another Citizen model with this function which may be similar (mod 948). On this model it appears the module and all functions appear to be working as they should, which is so important when collecting these old models. 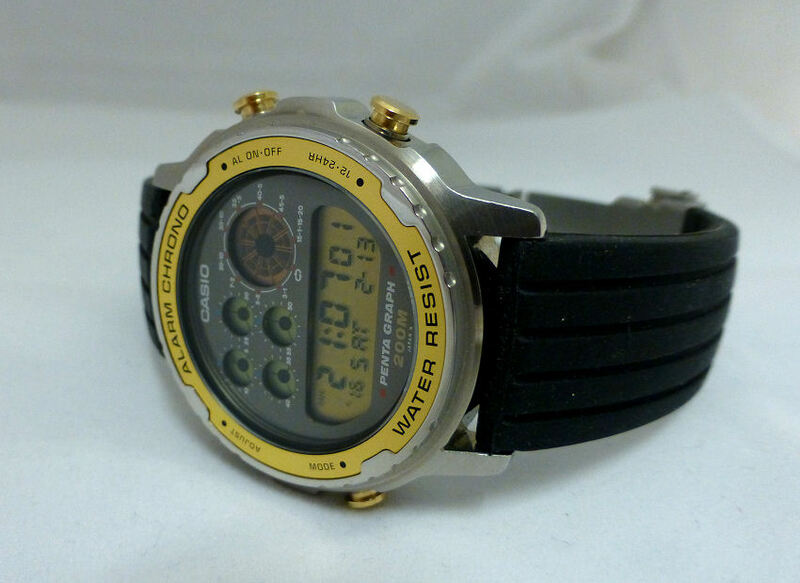 And as with many of these old Citizen and Casio models the term “Windsurfer” was basically a marketing description to attract those looking for a “complication” digital watch. Calculations as such, were limited to printed data tables on the original rubber strap, such as wind-speed/velocity etc. However the watch is conventional in that it features a fairly standard function set. Function-wise – it states them quite clearly on the dial in white lettering – Alarm, Timer, Stopwatch and Memo and the Time (hours, minutes and seconds), Day, Date and Month are running indications. There is also a colored mobile display in green and red showing seconds, with additional segments of 10, 20 and 30 second and a running 5 seconds are indicated in small blocks in a mobile green display and the collective times in red segments – so an interesting display even in standard timekeeping mode. The lower Time and Calendar digital dial contrast is exceptional for the vintage and is very easy to read. This model also has a 100m Water Resistance courtesy of a flat, steel 4 screw back plate, though being a vintage model I have not tried it out and don’t intend to either. But why is the D100 so difficult to find compared with the D060 or D120? – I have no real answer for that, but as a collector the attraction for me is perhaps just that very fact. I have seen a few of them before, though not in great condition, but also a long way from the UK, South America and Southern Europe as I recall. And that’s the thing about older digital vintage model variations, and there’s lots of ’em, that when you do come across one, you might have to do a bit of investigation to find specific or indeed any relevant information. The production date isn’t too difficult if you have an idea of the decade the model came out – the model number indicates the Year and the Month and even the number of pieces produced. But other than that, more often than not you don’t find much else with vintage digitals and sometimes you can draw a blank. In this instance there’s no indication of any Module No. which is a pity. (I’ll probably remove the back soon and see what’s stamped there). Generally though this lack of data is a real a shame as many of these models were variants resulting from a period when new modules and new technology were appearing almost daily and are the precursors of many of today’s current models. Anyway lack of information or not, I like this particular model as it’s different from the usual ones which could often scuff easily, whereas this metalized case seems that little bit harder and as a result is looking great and almost as new. Indeed it can be a fascination in itself collecting even just one model from a brand such as Citizen, as they were definitely front runners in both the technology and the display of data in watches at an exciting time in digital watch development. I know a few guys who specialise in just that and one or two have almost every version of the same model covering many years of development. Now I’m not quite as obsessive yet but I have done a little of that myself in the collection of Casio Compass function watches from the early 1970’s onwards. It showed me for example that the compass functions themselves haven’t improved much over the intervening years until the advent of the triple axis compass. Even then it was more to do with functionality than accuracy. (The need for keeping the compass flat and steady was no longer required). I say that as I’d still put up some of the older twin axis models against triple axis and if used properly I wouldn’t guarantee which would be the most accurate. So another vintage digital joins my little collection and I have more ready to Post once I’ve time to take the pictures. Three Casio multi-display models from the Golden Age that are in excellent condition and operating as well as they did when bought new.